This edited book aims to capture the functioning of human rights and civil activism at the level of the relationships between the individual and the social, and in relation to abuses, contestations, and transformations. Chapters cover the ways human rights are denied, articulated, and not realised. Mega-events, either sporting or otherwise (e.g. Gay Pride), tend to be the focus of this inquiry, although there are important contributions on grassroots non-governmental organisations. Overall, a range of research methodologies are deployed; the chapters vary between using primary research, using commissioned research, and presenting theoretically grounded arguments. The tendency is towards approaches that capture the empirical, everyday experiences, e.g. ethnography, autoethnography, interviews, focus groups, and observation. This book was originally published as a special issue of Leisure Studies. 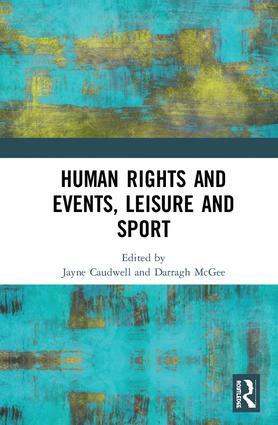 Jayne Caudwell is an Associate Professor and Head of the Research Centre for Events, Leisure, Society and Culture in the Department of Events and Leisure at Bournemouth University, Poole, UK. Her work is related to sport and leisure cultures, gender, sexualities, and social justice. Darragh McGee is a Lecturer in the Faculty of Humanities and Social Sciences at the University of Bath, UK. His research interests coalesce around the politics of youth welfare, human rights, and sustainable development as they intersect with sport and leisure cultures.